House of Parlance Media, Inc.
Last December our friends at Open Book Toronto interviewed Julie, ABE and myself about the Advent Book Blog. It was a fun interview and it gave us a chance to explain ourselves and our project but ABE’s part of the Q&A is the most memorable. I’ve posted it below. For the full interview check out Open Book Toronto. I’m looking forward to unleashing more of ABE’s crazy story later this year! Remember the Advent Book Blog? Remember how much fun it was? Remember the look on your mother’s face when she opened her gift on Christmas morning and saw that you’d followed the advice of Dan Wagstaff and got her a copy of Asterios Polyp? That, my friend, is the magic of giving books as gifts. And so, in hopes of creating even more looks bemused perplexion if not surprise and joy, we’re planning to launch a renewed version of the ABB in one month from now. Advent Book Blog & Open Book Toronto Present: Sociable! The Advent Book Blog and Open Book Toronto Want You to Get Sociable! Sean Cranbury and Julie Wilson of The Advent Book Blog and Open Book Toronto cordially invite you to an event for social media geeks, publishing professionals, and anyone with a passion for books and readers. Leading up to the event, Julie Wilson of Book Madam & Associates will unveil the identity of the six inaugural Associates, many of whom will be at the event. Find them and say hello! And be sure to get a piece of Sean Cranbury of Books on the Radio while he’s in town from Vancouver. He’s the big guy with the big voice and an bigger heart. Don’t miss him! Many thanks to Amy Logan Holmes and Open Book Toronto for their generous support and donation of light nibblies. Nom! Bring your insatiable thirst and enthusiasm! SOCIABLE! Natives are restless and have the tools to create the change that they want to see. I have always read the Globe and Mail. Still do. In the morning with the first freshly brewed coffee of the day in hand, the G&M website is the first place that I go for news. The quality of journalism and writing is quite high and I think that they’re weathering the sea change within traditional print media pretty well. Generally, I believe that they do an excellent job and have earned my loyalty over the years for the good work that they publish. So, it troubles me deeply how diminished and ineffectual the Globe Books section has become. The truest evidence of this for me isn’t the tone and style that they’ve adopted in their digital incarnation but the inability for their writers to generate any kind of engagement or conversation among the readership. The opportunity for healthy discussion often eludes them completely. The casual reader might even be inclined to think that the choices made for their 100 Best Books feature is decided more based on preserving advertising revenues with the big publishing houses than finding the best books for any given year. And book lovers, savvy, impatient and tired of the usual suspects in the usual places, have no limit of alternatives. Enter the Advent Book Blog. Real people, passionate about books and reading, recommending their favorite books in short bursts of enthusiasm with no strings attached. Done out of love and a desire to share – bedrock fundamentals for a healthy book culture. Another alternative is the CBC’s Canada Reads competition, hosted by the affable and well-coiffed Jian Ghomeshi. It’s essentially an opportunity to start a national conversation about Canadian books championed by celebrities and hosted in Toronto. I am a fan of the competition and because of the CBC’s mandate to be all things to all people my expectations for the books selected every year is modest. I’m just happy that we’re showcasing reading on a big stage and having some fun doing it. But, of course, not everybody feels the same way. This year there is palpable frustration over the selection of Ann Marie MacDonald’s Fall on Your Knees and Douglas Coupland’s Generation X. Both hugely successful books have been devoured by countless readers all over the world. Here in Canada, readers are apparently tired of being advised to read something that they’ve already read. To have a conversation – evangelistic, enthusiastic or otherwise – that they’ve already had – 10 years ago! Going through the motions isn’t good enough for them. Enter the National Post’s Canada Also Reads. Real books – that haven’t already been swaddled by Oprah or big literary awards – recommended by real people. The Advent Book Blog and the National Post’s Afterword book section succeed because they give their readership a voice, because they engage them in genuine conversation from the very beginning and because they’re not seen to be publicity vehicles for big publishing houses. These two places understand the power of the digital environment to connect directly with their readers and to offer their readers a platform to express themselves and to become a part of a larger community and conversation. That is power. That creates genuine enthusiasm and loyalty. The conversation about books in Canada is big enough to include all kinds of publications, platforms and competitions. The best one’s in 2010 will be inclusive, generally transparent and engaging. If the traditional book channels can not provide those things then readers will go elsewhere or build their own better alternative. Please also check out my follow-up piece on this called Globe’s Book of the Decade: Zero Comments, Wrong Cover. Listen to Joe Planta interviewing me about the Advent Book Blog here. December 2009 has been all about the Advent Book Blog for me. The ABB – for short – has been an excellent project that has gathered together a huge range of people to recommend a huge range of new(ish) books for Holiday gift giving. Julie Wilson is my partner in crime in organizing this viral online book community. For those of you who don’t already know of Julie, she’s behind the voyeuristic literary blog Seen Reading and is currently dividing what remains of her personalities between her life as Bookmadam and the mercurial Rebecca Wilcott. We have done a few online written interviews over the past few weeks, too. Erin Balser was the first one in the water with her Q&A for the Torontoist.com on December 1st. Amy Logan Holmes and Clelia Scala of Open Book: Toronto interviewed Julie, me and ABE the Advent Book Elf a little later in the month. Now, here’s a phone interview that I did with thecommentary.ca‘s Joseph Planta last week. A great interview where we touch all bases of the Advent Book Blog from inception to execution. We talk about Vancouver book stores, the power within the bookseller/customer relationship and my upcoming brief custodianship of the commentary.ca while Joe takes a break. Listen to the interview and let me know what you think. Apologies for the infrequent posts here but I’ve been spending most of my time working on the Advent Book Blog and a few side projects. If you haven’t been checking the Advent Book Blog (@adventbooks) then I suggest that you get there, it’s a game changer. In the meantime, check this interview with Doug Coupland and stay close for Books on the Radio’s Project 2010. So, a weird edit of the Marta Chudolinska interview is up at the podcast place and you can listen to it by clicking this link right here. Have some patience with the sound file. You just gotta get thru the weird extended ending from the previous radio show on CJSF. Also, there’s a classic hard cut edit at the end where I snap off the interview at the point where Marta glows about her parents. I cut it there because it was such a positive comment, said with such obvious love that I decided that the best thing to do would be to drop a Great Lake Swimmers song at the end and call it a day. Great interview! Marta is awesome. There was a cool book launch party at Lucky’s Comics on Main Street which is always a great place to be on a Friday night. You can check the action on her sweet Back + Forth website which includes some snaps of the Vancouver Launch. During the interview Marta touches on the influences of a few different artists like George Walker, Shary Boyle and Kara Walker. 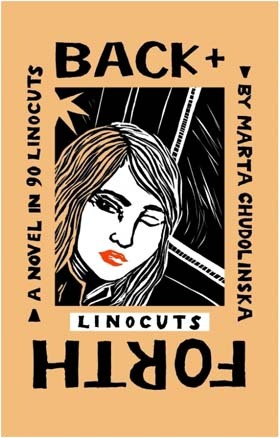 If you’re looking for a great gift for visual artists or young women or older women or a favorite linocutist in your troupe, I highly recommend Marta’s book. In fact, if you’re interested in suggestions for the best books to purchase during this holiday season check out the Advent Book Blog – fully endorsed by Books on the Radio.